In daylight, rods are known to be bleached: we have to wait some time after going into darkness before scotopic vision becomes effective. 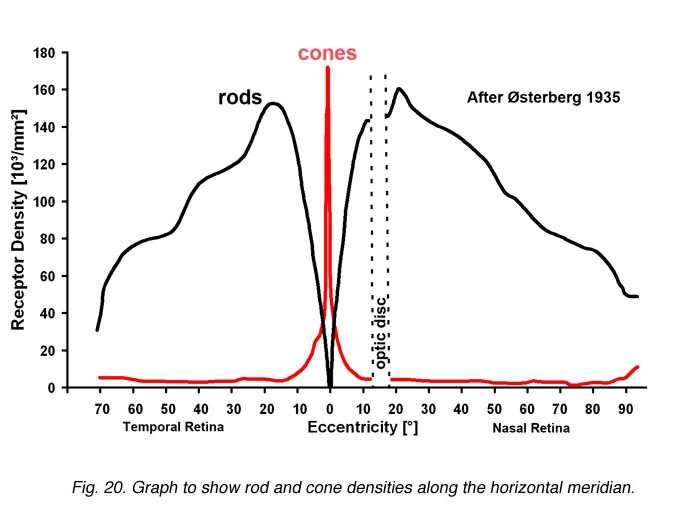 But, as I understand, peripheral vision is also mostly due to rods, since away from the fovea, cone density rapidly declines. But I wonder then: if rods normally saturate in bright light, why does peripheral vision still work in daylight? In photopic lighting, peripheral vision is mediated by cones. The rods are indeed saturated at daylight, and even at twilight (source: Nature). However, the cones are active and although their density in the periphery is low, they are still present (Fig. 1). Hence, peripheral vision in photopic lighting conditions is mediated by cones. Because of their low density in the periphery, however, visual acuity is low (Kolb, 2012). Not the answer you're looking for? Browse other questions tagged neuroscience neurophysiology vision sensation or ask your own question. Is our color vision calibrated to sky, vegetation, and blood? Why is my peripheral vision better for seeing in the dark?